Check the Fien Print: MovieWatch: "Shrek the Third"
In a Nutshell: It's hard for me to exactly put my finger on why "Shrek the Third" is such a very unsatisfying movie. It doesn't suffer from the usual problems that plague sequels, in that it isn't too long and its problem isn't overkill, too much of a good thing turned to bloat. If anything, "Shrek the Third" isn't stuffed enough -- if the first two movies were rewatachable for the inside jokes, I often found myself looking around the frame desperate for amusement and finding none, this on the first viewing. At the end of the day, I'm left to wonder how much of the franchise's appeal was directly related to Andrew Adamson, who helmed the first two films and is off doing things in Narnia (not very well). The first two movies weren't great, but they were charming and they created a very specific fairy tale universe populated by mostly appealing characters. Where have they gone? Shrek and Fiona are mostly the same, only less funny, less specifically ogre-ish and princess-y. 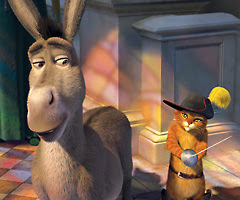 Eddie Murphy's Donkey, a reliable source of somewhat guilty laughs in the first two films (the character's a racial stereotype, but a funny one that kids love! ), isn't even vaguely the same here. Has he been hen-pecked into a dullard by his dragon wife and not-the-least-bit-interesting dragon-donkey kids? And what happened to Puss In Boots? Antonio Banderas still gets a chuckle or two, but not many. The writers also have decided that certain tertiary characters -- Larry King's Doris, the Germanic Three Pigs, Pinocchio, the three blind mice -- needed more screentime, but never figured out anything for them to do. So they're just loitering in the frame, actually draining scenes of mirth. The movie makes a minimum of a dozen direct references to the first two movies, which also counts as lazy writing, as does the fact that the movie's theme hasn't gotten any more interesting than "Just because people see you as one thing [a geek, a monster, a loser] doesn't mean that you can't be something else if you want to be." Incidentally, that's a good theme. I endorse it. It's just the same as the last two movies and yet people keep having to explain it in long speeches. None of the new characters are distinctive -- Ian McShane's Captain Hook is sure to be a standout for elementary school "Deadwood" fans. And I'm not sure the young audience I was with enjoyed much more than the scenes with the baby ogres. That's far from the semi-adult humor of the first two movies. Grown-ups will have to be satisfied with on "Six Million Dollar Man" gag, an unexpected Led Zeppelin reference and a closing rendition of "Thank You (Falettinme Be Mice Elf Agin)" leaves at least an iota of the funk of the Sly and the Family Stone original.